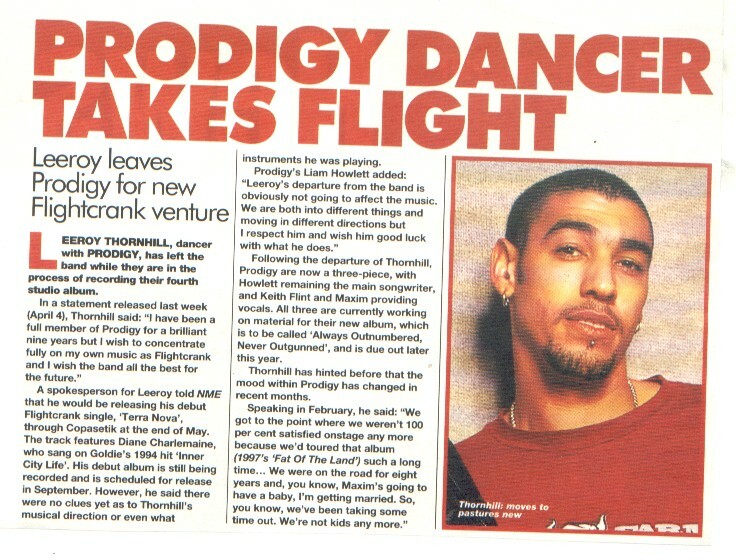 Leeroy Thornhill, dancer with Prodigy, has left the band while they are in the process of recording their fourth studio album. In a statement released today (April 4), Leeroy said: "I have been a full member of Prodigy for a brilliant nine years but I wish to concentrte fully on my own music as Flightcrank and I wish the band all the best for the future". Liam Howlett, the main songwriter for Prodigy added: "Leeroy's departure from the band is obviously not going to affect the music. We are both into different things and moving in different directions but I respect him and wish him good luck with what he does. " Following the departure of Thornhill, Prodigy are now a three piece, with Liam Howlett remaining the main songwriter, and Keith Flint and Maxim Reality providing vocals. All three are currently working on material for their new album, which is to be called 'Always Outnumbered, Never Outgunned'. Thornhill has hinted before that the mood within Prodigy has changed in recent months. Speaking in February this year, he said: "We got to the point where we weren't 100 per cent satisfied on stage any more because we'd toured that album such a long time... We were on the road for eight years and, you know, Maxim's going to have a baby, I'm getting married. So, you know, we've been taking some time out. We're not kids any more. " Thornhill is expected to start recording for his solo project, Flightcrank, but a spokesperson for Prodigy could not confirm any more details.